Neonatal Screening is an important preventive measure to detect severe irreversible damages caused by congenital metabolism disorders and endocrinopathies at a very early stage. One elementary integral part of the screening programme is the determination of the amino acids and acylcarnitines profile. The defects detected in these profiles are aminoacidopathies, fatty acid oxidation defects, carnitine cycle defects and organoacidemias. 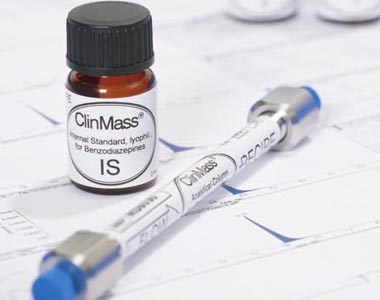 The RECIPE ClinSpot® LC-MS/MS Complete Kits MS10000and MS10100 provide reliable screening with an injection interval of only 1.6 min. The entire sample preparation is performed with 96-Well-Plates, alternatively also in combination with filter plates, in order to ensure a high sample throughput. The measurement in MRM mode ensures precise measuring results. The complete kits contain all reagents needed for the LC-MS/MS analysis, as well as dried blood controls with 26 analytes (13 amino acids, free carnitine, 12 acylcarnitines) and the Internal Standard IS including the respective isotope-labelled analytes. 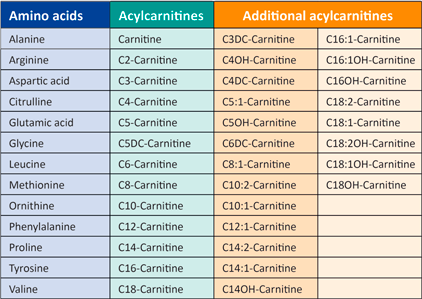 The determination of additional acylcarnitines is possible.